Here's a first beta version of Sweet Home 3D 5.0. - It's now possible to select items in furniture groups to modify them without the obligation to ungroup them. From the tests I made in other software proposing this kind of feature, I chose the following behavior: to select an item of a group in the plan, you'll have to click first on the group, then on the item, and if the item is in the subgroup, click again until you reach it. Multiple selection of group items can be done if you press the shift key. As pieces of furniture are also listed in the furniture list, you'll have also the choice to select one or more item from the furniture list, whereas the selection in the furniture list and in the plan are synchronized. - Opened groups are now saved in .sh3d files and restored when the file is reopened. - I added Edition > Paste style menu item to copy the style of the item in the clipboard (i.e. a piece of furniture, a wall, a room or a text) on the selected items. By style, you should understand the color, texture and shininess in the case of furniture, walls or rooms, and font name, size and color in the case of texts. - To avoid some confusion about whether a furniture or textures library import completed with no issue, an information message is now displayed once the library is imported. - 1/8 1/4 3/8 1/2 5/8 3/4 7/8 fraction texts (written with 3 characters) are now allowed to be entered as inch fractions when Foot/Inch/Fraction unit is in use. - The pitch rotation of the virtual visitor head can now go from -90° to 90°. This is a first part and there should be other new features available in the coming weeks. Hope you'll enjoy these first ones! Text tool, formatting and 3D view. Background/texture import size warning: Background image proposed reduced from 7064x4960 to 3375x2370, but maybe most important is the warning message). Pitch rotation of the virtual visitor. Great features, nicely implemented. Especially 1 to 4 are very welcome. Will try more later. Congratulations with v5.0b and thank you very much for your continued efforts to make a great program even greater. I did a few rapid test under Kubuntu 14.04 64-bits. These all work just as expected. Great addition. After thinking what this could mean, I guessed I had to draw a room and see what happens. 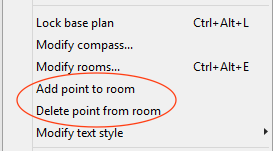 And indeed, it adds an extra point/corner to a room at the cursor coordinates. Maybe a few extra words of explanation would be nice. In combination with the AdvancedEdit plug-in this is VERY nice. Could that plug-in be integrated in the main program? After nesting a few items 5 or 6 groups deep, I was able to succesfully edit each item. I can't figure out how this works. Sorry for being stupid. I didn't test the other new features. Could that plug-in be integrated in the main program? It's not what I plan at the moment. It lets you copy the color/texture of a given copied object on others selected objects of the same kind without displaying again their modification dialog. It can be also used to keep in memory the color/texture of a room for example, when the quickest way to recompute a room is to delete it then recreate it with a double-click. Note that you can copy the style of a room only on rooms, copy the style of a wall only on walls,... and there should be only one object in the clipboard to enable this new menu item. 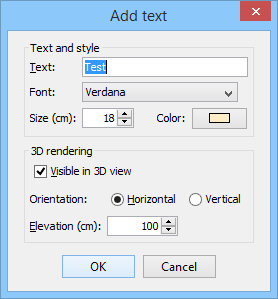 1.fonts in 3D display too Fuzzy,Especially when a large text size. 2.Background coordinates plus or minus is wrong . But if needed this trick is still working. No, it's correct. X and Y are the coordinates of the origin of the plan in the image, not the coordinates of the top left point of the image in the plan. If the Chinese translation of the wizard isn't correct, feel free to propose a better one. "此处定义图像的坐标原点" Should be replaced "此处定义户型的坐标原点所处在本图片的位置"
Now,with Add point to room Function. I recommend Added a new feature to hollow room. because create room is very important, The simplest way to establish basic parts.but the existing feature is too cumbersome.Not directly hollow. I recommend 3 shortcut keys. add points,del point,hollow point. When the hollow-point in the room range, when the hollow room!